with poppies, nasturtium, dill, and others. The first plants I ordered from a print catalog were gladiolus. I fell in love with a variety called 'Priscilla', a ruffly-edged flower of pale pink and yellow ringed by a deep rose border. Introduced in the '70s, 'Priscilla' is a stalwart beauty that has proven to be more hardy than many others. 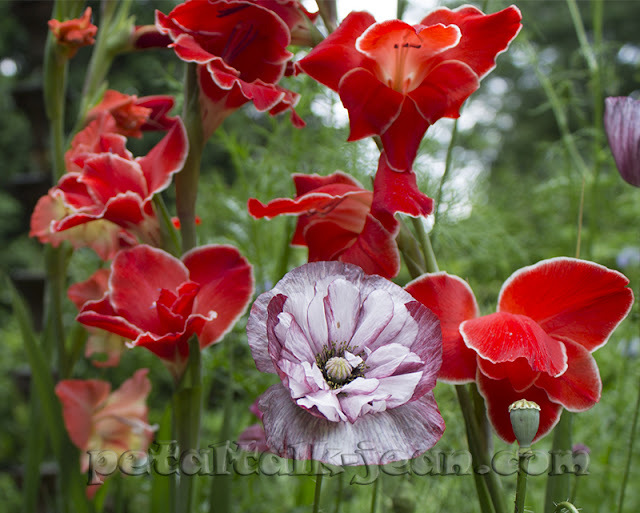 It was the '90s when I threw caution to the wind and ordered a few dozen corms of 'Priscilla'. Gladiolus 'Atom' is my favorite. They did very well, but I hadn't learned the nuances of succession planting, or planting sequentially so that they wouldn't all bloom at once. 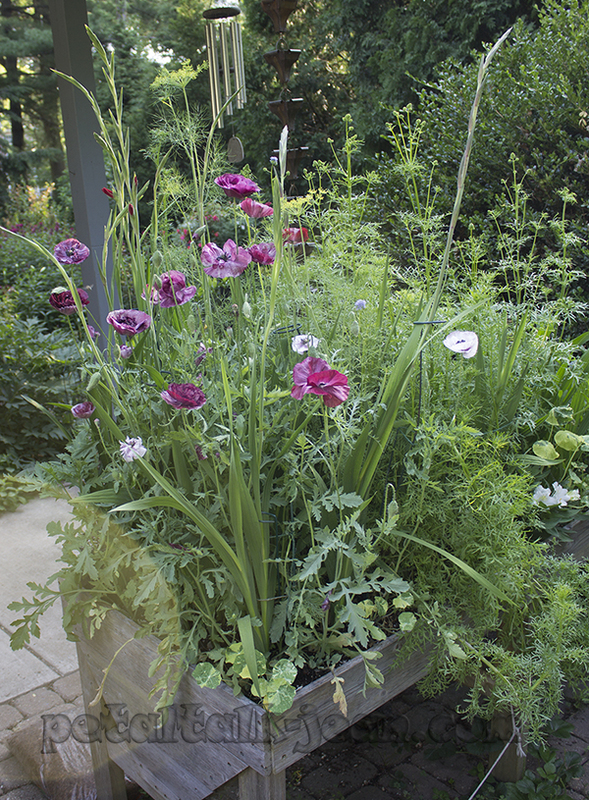 Having around 45 straight-up stalks of blooms didn't turn out to look great in a garden setting. I remember thinking they looked like a floral fence. I wasn't that interested in cut flowers at the time, either. I've shied away from glads because of their rigid, no-nonsense demeanor. But then I learned about Old House Gardens, a company that specializes in heirloom bulbs. Yes, I know. In a world where we all seem to be looking for the latest thing--whether it's tech gadgets or better-tasting fake sweeteners--sometimes it's good to put on the brakes and look back a few years. I planted just a few corms this season. I'd recommend two varieties no matter what you think about glads. Gladiolus 'Atom' cavorts gracefully with poppies. The adorable 'Atom', which made its debut in 1946, is my favorite. I love that it tops out at just under three feet tall, and I'm charmed by its bright cherry-red petals edged in white. And compared to the rigidity of a typical Gladiolus, 'Atom' has a graceful spacing along the stems that makes it look less formal and more like it belongs in a garden. I also order three corms of a variety called 'Lucky Star', a purportedly fragrant type that is a keeper even if I can't detect a scent. 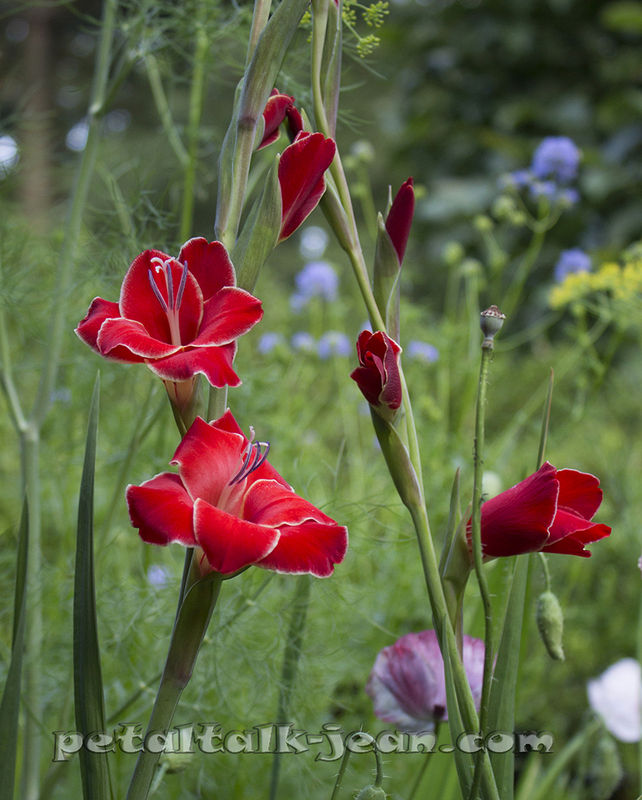 'Lucky Star' was introduced in 1966, and is one of the few fragrant Glads on the market. As a cut flower, 'Lucky Star' is more delicate than a lily, lasts just as long in a vase, and doesn't have the mess-making pollen that has to be dealt with. The blossoms' color goes with anything, and its vertical lines adds a little bit of "ups" to an arrangement. 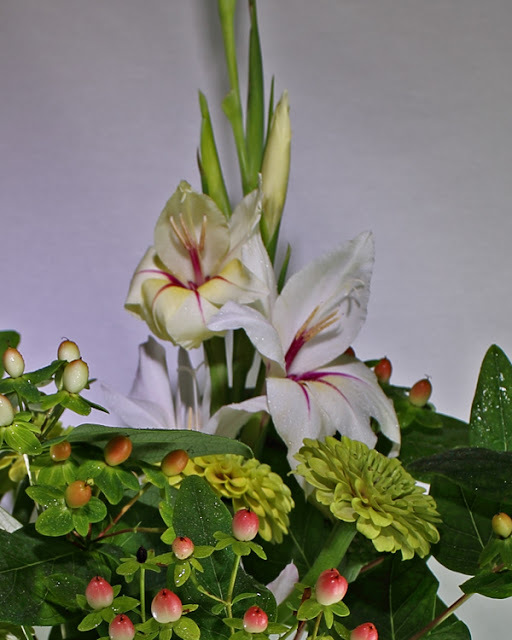 Gladiolus 'Lucky Star' adds vertical beauty to an arrangement. I will be marking 'Lucky Star' to remind me which corms to dig this fall, or as soon as the foliage turns brown. According to Old House Gardens, this variety is rare. They're crossing their fingers that the harvest numbers from the growers will be large enough to offer them for sale next spring. It is odd that you post about Glads. Last year I bought one of those cheap bags of glads and planted them. I have always thought of them as funeral flowers since back in the 60's and 70's that is what florists seemed to use for funeral arrangements. Tastes have changed and for some reason I couldn't resist the colorful picture on the glad bag. I must say these cheapies didn't disappoint even without extra water and forgotten once put in the ground. They grew and flowered. I dug out a few of the corms but really didn't even think of them again until this year when a few of the corms that were left in the ground popped up. Lo and behold they bloomed. A bright pink and yellow one survived our mild winter. I do like your find of some older varieties. I think I have seen Atom before. I think I will look into getting some of these older varieties. I know the hummingbirds and butterflies like them.